The ever so popular Trout Lake is filling up fast, with only 2 New lodges remaining at Heron Lakes. You’ll have to pop down and see what we can offer. 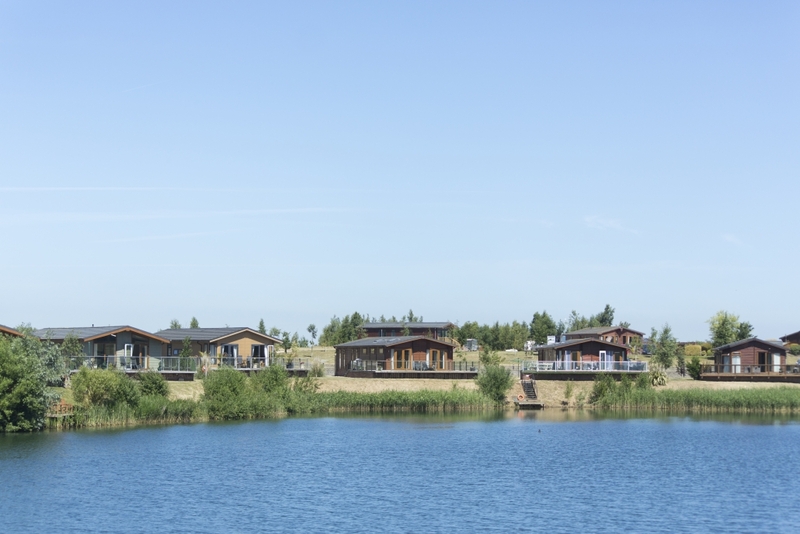 A exclusive development of only 9 plots, the Trout lake is truly a stunning spot to be. Even though we only have no empty plots at Heron Lakes, don’t be disheartened. The Prestige Acorn and the Prestige Maple are our stunning Show homes, already sited and ready to go. You can be holidaying straight away, here in East Yorkshire. What a view to start your day. . .
With a view like this its easy to see why we only have TWO NEW luxury show lodges remaining to buy at the Trout Lake. One of our BEST selling single lodges across many parks and we can see why! With its open plan living area has a spacious and stylish design. A stunning Scandi modern feel throughout with an added colour pop. It truly is a stylish interior. A fully equipped kitchen including dishwasher makes for a relaxing break away. There is plenty of space to entertain guests with a dinner party or two. Enjoy a double bedroom with walk in wardrobe and the 2nd twin bedroom comes with fitted wardrobes. Lazy Sunday mornings complete with breakfast in bed is a yes please. A spacious decking area is also included to enjoy the quiet secluded plot. 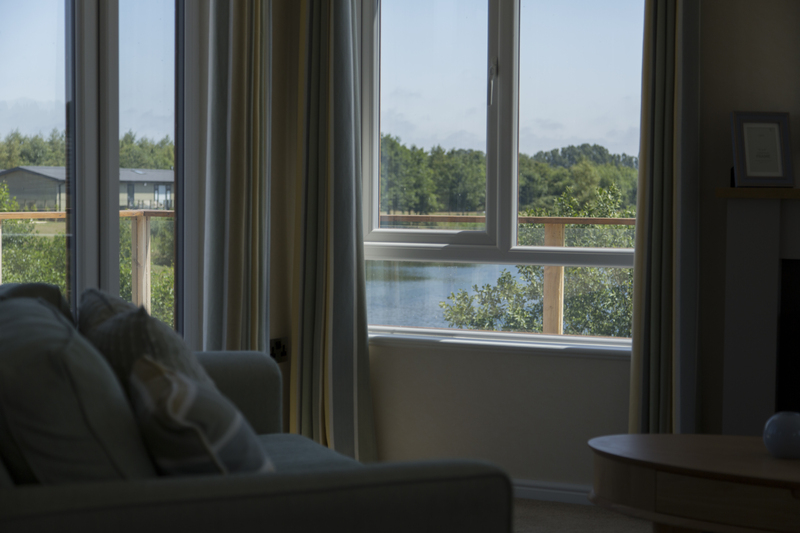 With stunning views across the park, the large windows will let you enjoy the wildlife on the park! Situated looking over the Trout Lake development, located centrally amongst a select number of 9 lodges with stunning views and tranquillity. Natural and warm colours have been used throughout this luxury lodge, its calming caramel tones make this space a beautiful place to relax and get way from busy life. With oak and cream cabinetry and furniture, there is a sophisticated flow throughout this lodge. 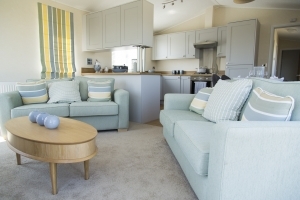 This two bedroom lodge is charming and cosy, offering a modern kitchen with a dishwasher included. You will find a utility room neatly tucked away including a washing machine. The separate lounge and dining room offers space and lots of natural light, making it perfect for entertaining. French doors open onto a beautiful decking which is all included. A beautiful space to sit enjoy lunch and take in all the beautiful scenery in your secluded spot. To the rear the lodge offers a study and family bathroom with 2 double bedrooms with en-suite and walk in wardrobe to the master and fitted wardrobes in the second. With the purchase of this lodge comes a 10 year platinum British standard structural warranty. 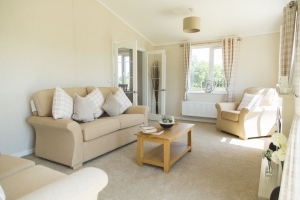 To find out more about how our lodges are built here. Heron lakes is a STUNNING haven of peace and tranquillity. Set in 75 acres Heron Lakes boasts four BEAUTIFUL lakes, surrounded by all types of nature. Between the beautiful historic market town of Beverley and the picturesque East Yorkshire Coastline. Its a perfect location for a Holiday to relax and unwind. Interested? Why not call today on 01964 545968 or email info@coastline-leisure.co.uk to arrange your park tour and meet with one of our friendly team who can provide more details and answer all your questions. BE QUICK …. ONLY TWO NEW PLOTS REMAINING! BBQ’s and Lodge Viewings A different kind of view. The Night sky!